Setting up Beanstalk repository and using it with TortoiseSVN on windows platform is really easy. 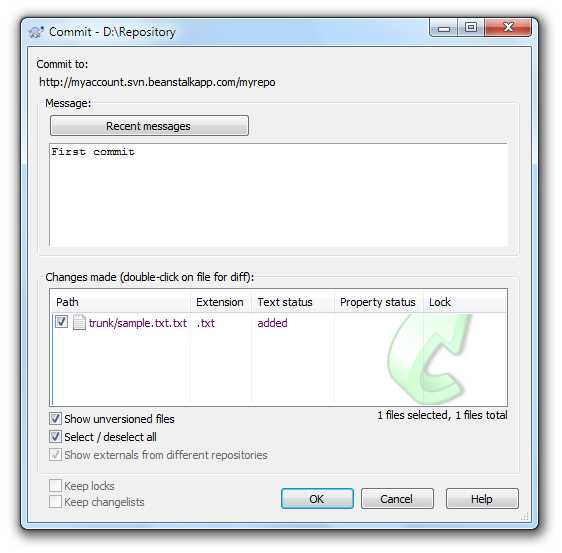 In this article we will show you how to checkout a Beanstalk repository, add a file to it, and do a commit. Then, in windows explorer, right click your mouse button, on place where you would like to download (checkout) your repository, in the the screenshot, we have chosen "D:\Repository". A popup will show up where you will see the TortoiseSVN actions. Choose SVN Checkout. 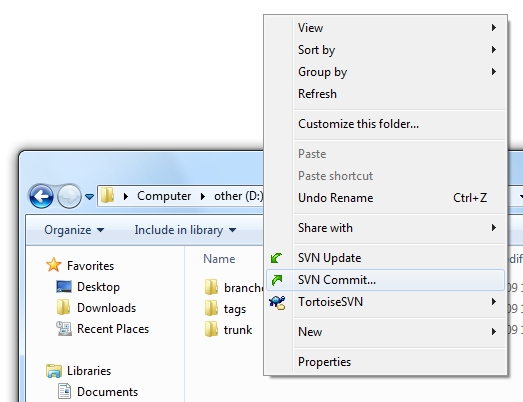 A Tortoise Checkout window will popup and you will need to insert the URL of your repository (this is the one with "svn" in it). After inserting repository URL, click Ok, and TortoiseSVN will begin the checkout of your repository. 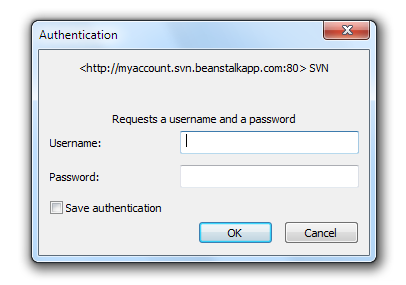 In this process, you will be asked for the username and password of your Beanstalk account. 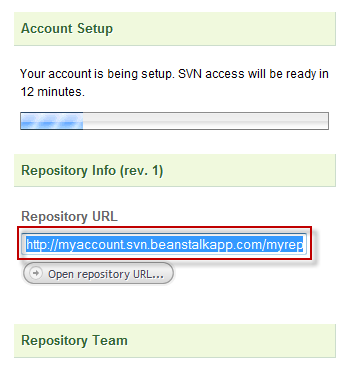 You should use the username and password which you use for logging into Beanstalk (not your email address). You will be asked for your username and password every time you make changes to your repository. If you want TortoiseSVN to remember your credentials, check "Save authentication" in the security popup. 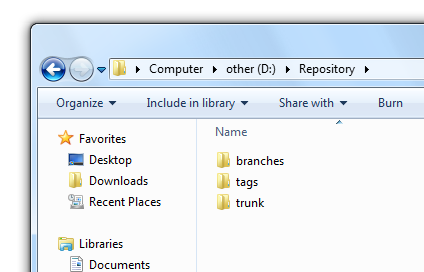 We will add one file to the trunk folder. 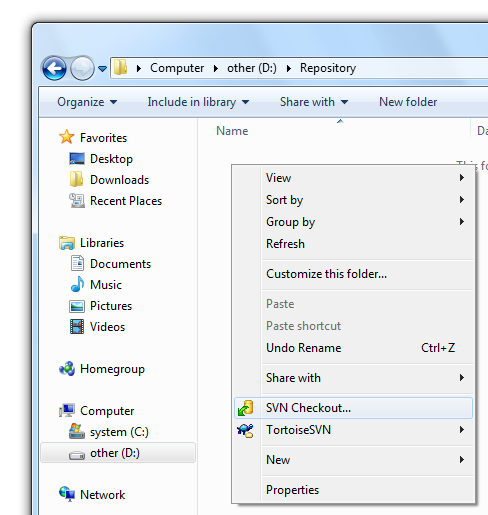 In order to do that, all you need to do is copy the file to that folder, right click on it to get the popup, and select TortoiseSVN->Add from the menu. This tells Subversion that a new file is added and ready for commit. After this, you will see a Tortoise window which will prompt you for entering a message. We highly recommend that you describe each commit and what has changed. All you need to do now is click the "OK" button and Tortoise will begin uploading the files and updating your repository in your Beanstalk account. 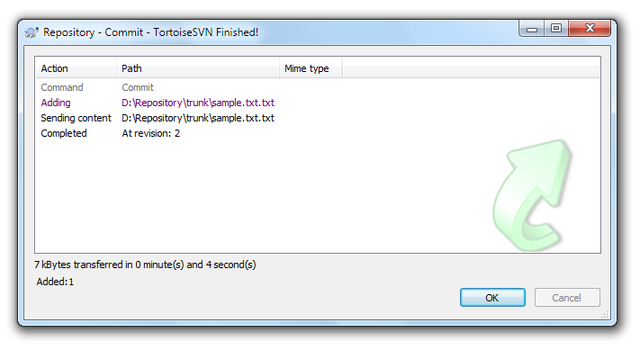 When Tortoise is finished, it will show you a notification window that the process has been finished. Well done! You have finished your first commit to your Beanstalk account. In very similar way you can do more advanced things with TortoiseSVN and Beanstalk. We recommend both the TortoiseSVN documentation and the free online Version Control with Subversion book. For more advanced users you could even setup TortoiseSVN so it makes it easier for you to post commit messages which would contain tags, in case you are using some of our integrations. To read more about this, check out this page in TortoiseSVN documentation.